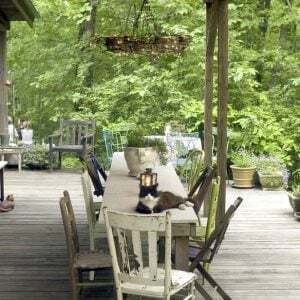 I’m a big fan of good garden design, and architectural plants can go a long way towards curing any design flaws your garden is suffering from. Why? Because one of the major mistakes most gardeners make is lack of focus in the garden. When your beds start to look flat, or too busy, or not connected…chances are you really need some good focal points. It’s just like decorating a room. You need a major piece of art, or a fireplace, or a magnificent window view, or a conversational piece of furniture to really make a design sing. Same goes with garden design. Architectural plants, or structural plants are a great way to add one, or more focal points to your yard or garden. Some quick tips on using architectural plants, and then some of my favorites for you to try! Remember that many of these plants get large, so make sure you plan for their mature size. They lose their effect if they are swallowed up by the rest of the garden bed. Many of the more dramatic architectural plants look best set a bit apart in any case, so there is space between them and other plants. Don’t forget to pay attention to their sun/shade and soil needs. Just because an Elephant Ear may look amazing in your herb bed, doesn’t mean it can handle the full day of sun. Basic plant care can’t be forgotten! Decide whether your structural plant will be the star of the bed, or whether it will have supporting players. The more attention directed at a structural plant, the more dramatic the planting, so keep your supporting players to a minimum if thats the look you are after. On the other hand, if you want a more casual look, but with the focal pop, feel free to add a few more colors and textures to the bed. Make sure you do your proper trimming and deadheading in a timely manner. 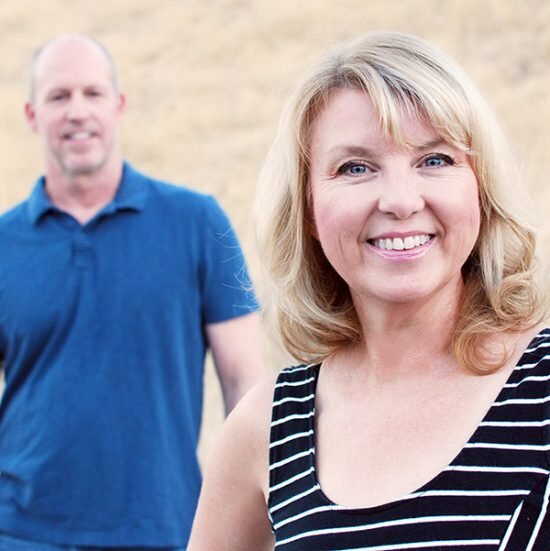 While I’m not usually uptight about minor garden chores (ask Steve!) in this case all the attention will be on your focal plants. You want them to look their best. There are many plants that have strong structural presence in the garden, from palms to cactuses, sedums to tropicals. I’m going to encourage you to look into those types of plants if you live in a zone that can support them, because their exotic nature make them prime focal loin candidates. But I’m going to stick to perennials here because I think they have a broader range over a lot more garden zones, and because that’s where my experience lies. Here are a few of my favorites, and how to grow them! 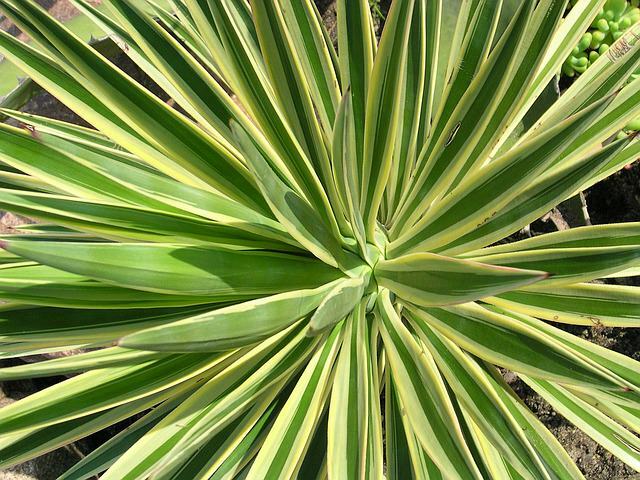 Yucca – Famous English garden designer Gertrude Jekyll used Yucca as a mainstay in her beautiful cottage style gardens for architecture. 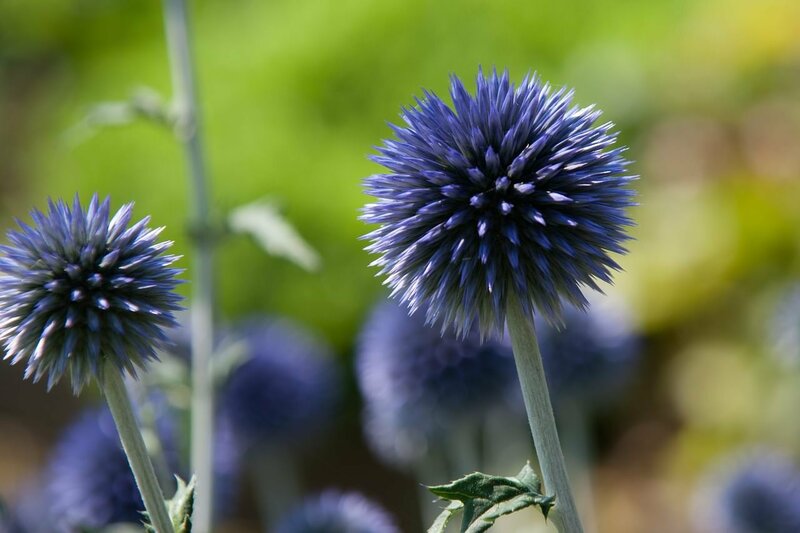 Hardy down to zone 4, these evergreen spiky wonders are a great structural plant any time of yea,r but they have a secret… when in flower, they give a spectacular show! Stalks of flowers 6 feet high are common, and last for weeks in June. 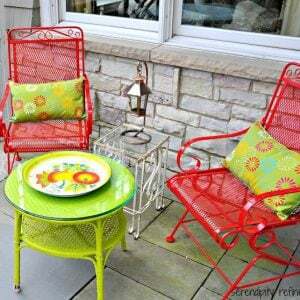 Leaves can be green, red, or variegated, and all they want out of life is well drained soil and lots of sun. Drought resistant too! New Zealand Flax – Another beloved strappy leaved plant that is actually related to grasses, New Zealand Flax is grown as a perennial in mild climates, and an annual in colder ones. Red or green leaves can reach up to 10 feet in those mild climates, they are much smaller in areas that frost as they only grow one season. Make a great container plant in colder climates. Photo by ‘Grows on You‘. Rodgersia – A large, tropical looking plant that comes back year after year down to zone 5. Three to six feet high and wide, they love shade to part sun, lots of moisture and protection from wind and afternoon sun. This makes a dramatic statement in any bed! Photo by ‘Fine Gardening‘. 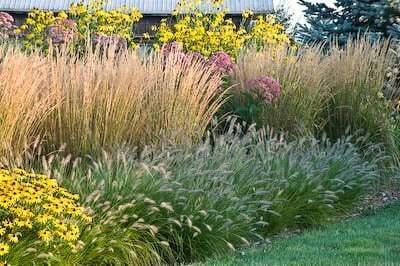 Ornamental Grasses – There are more ornament al grasses than I can cover in this post, but you can learn more at our post on, well… ornamental grasses! They all make a statement in the garden, I have numerous varieties and at least one in every bed. Calamagrostis “Karl Foerster” is my fav upright variety, though there are several new ones that deserve attention. Any Miscanthus also makes a statement, especially the variegated ones. 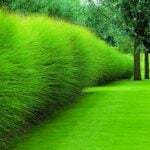 There is an ornamental grass for almost every zone and situation. Photo by ‘Country Gardener‘. 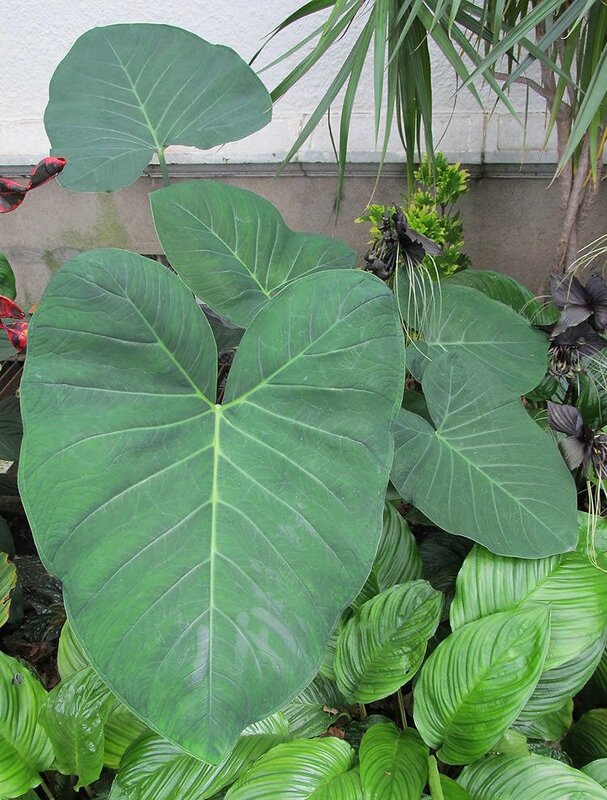 Giant Elephant Ear – Talk about architectural plants! 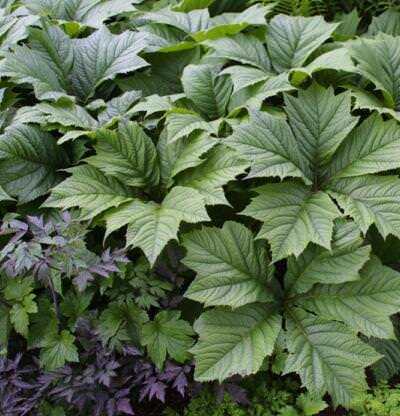 This is a tuber that grows large, tropical looking leaves and stands up to eight feet tall, and is a wonderful addition to any shade or part shade garden. Only hardy down to zone 7, you can lift the tubers for winter if it isn’t hardy in your area. Loves water, fertilizer and shade in the afternoon in hot areas. Photo below from Houzz. These elephant ears are from ‘Longfield Gardens‘, and are paired gorgeously with some richly colored caladiums. Perfect tropical look! 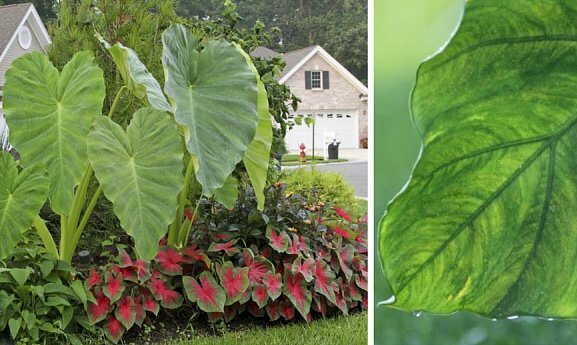 Longfield has one of the best selections of elephant ear varieties… we love the upright forms! 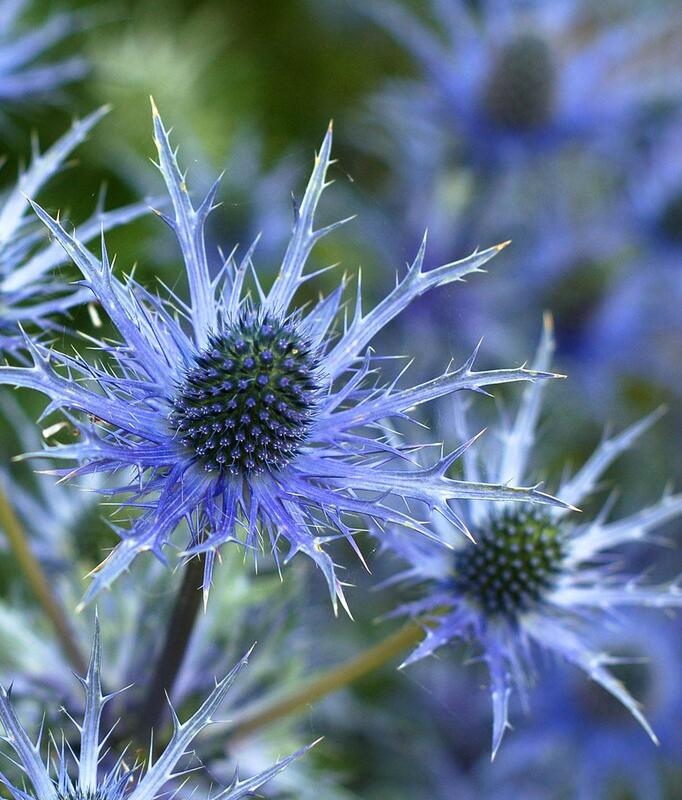 Sea Holly/Eryngium – Sea Holly is a striking plant just made for that hot, sun baked spot. 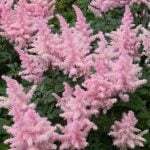 Needing full sun, very drought tolerant, and thriving on neglect, these plants are perfect for xeriscaping. Blue, unusual blooms in midsummer. These plants can grow 6-8 feet tall in some varieties, but they tend to not grow very wide, so plant several 2-3 feet apart for a good show. Hardy down to zone 2, they do not transplant well so make sure you put them where you want them! 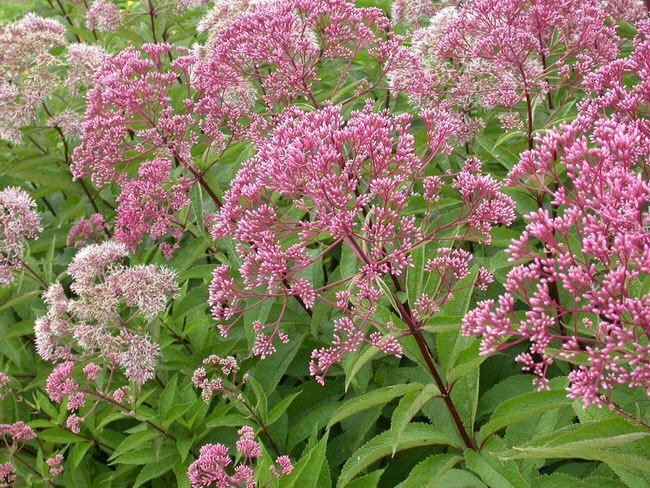 Joe Pye Weed – A native to the prairie state, this large perennial grows 6-8 feet high and wide. Blooming in late summer with broad, plate like flowers that resemble sedums, in a dusty purple. A dwarf form is available. 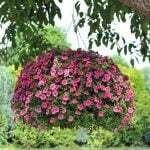 Make sure you buy a named variety, like “Gateway” in order to get large flowers and a stronger plant. 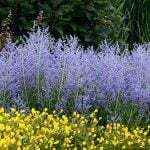 Prefers sun, moist soil, and looks best if cut down to the ground in early spring. Photo by ‘ISU Extension‘. Finally, we have horsetail. 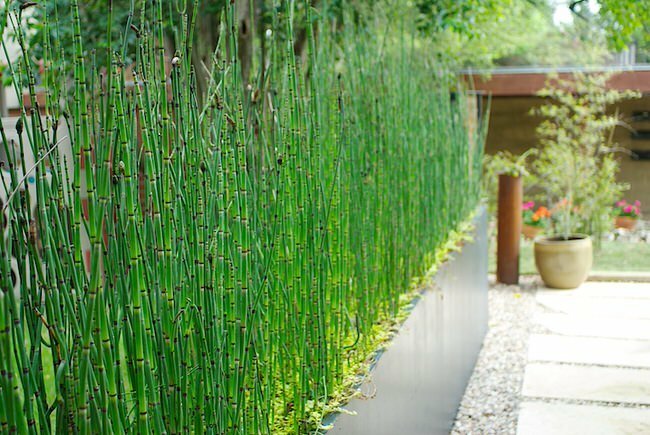 Horsetail reed is a grass that dates back to a prehistoric age. A water loving plant that can actually grow in swampy soil, this plant loves sun but will tolerate some shade. Evergreen in mild climates. Great used in a modern or contemporary garden for it’s structure and texture. One of our very favorite architectural plants to use. Fast growing to 3-4 feet, it spreads underground and will spread indefinitely if not contained. Because of this, a great container plant. 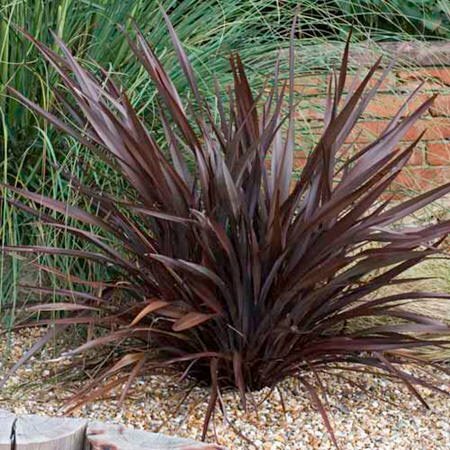 Avoid horse tail reeds, this is an extremely invasive plant, it spreads underground as mentioned as well as the pores during spring (planting in pots will not help) . I live in Dallas and planted them for the modern look and within a season I had shoots coming up in my neighbor’s flower beds 20 feet away. It took me 2 years to finally get rid of them. perennalsfrom MRS gertrud jekyll still growin up in my creative gardens .. i hope….!!! trying to be a disciple. I have horsetail in pots in my garden. My question is how do I keep them growing straight up? Some of mine are going every which way and I really would like them to be like your picture. Also, how do I trim them to keep a straight height! I saw them in California and got some here in Florida and love what they look like if I can get them to go straight. I need help! I haven’t killed them yet! Are they growing in full sun? 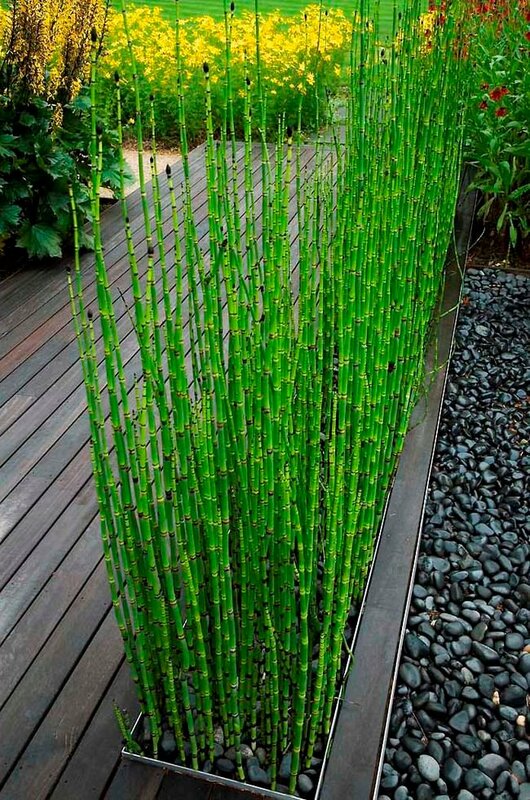 The horse tail is equisetum and is not a reed or a type of grass. It is its own plant in its own family. Please only give accurate names and families. Sincerely a botany student. Thanks for setting us all straight! I like horsetail but when i plant them they die. Please heed the warning to contain Horsetail reed. In England I have known it to crumble concrete patios with the host plant being more than 10 feet away. Another example of how strong and invasive this plant is, (in the right conditions) it has invaded house foundations so sellers cannot sell their property. If you have neighbours please do contain this rather beautiful, architectural plant. Just wondering what the green foliage in the trough is ? is that the horsetail ?